Hassānīya (Arabic: حسانية‎‎ Ḥassānīya; also known as Hassaniyya, Klem El Bithan, Hasanya, Hassani, Hassaniya) is the variety of Maghrebi Arabic originally spoken by the Beni Ḥassān Bedouin tribes, who extended their authority over most of Mauritania and the Western Sahara between the 15th and 17th centuries. It has almost completely replaced the Berber languages spoken in this region. Although clearly a western dialect, Hassānīya is relatively distant from other North African variants of Arabic. Its geographical location exposed it to influence from Zenaga and Wolof. 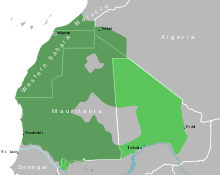 There are several dialects of Hassaniya which differ primarily phonetically. 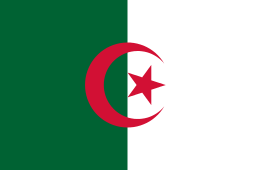 Today, Hassaniya is spoken in Algeria, Libya, Morocco, Mauritania, Mali, Niger, Senegal and the Western Sahara. The phonological system of Hassānīya is both very innovative and very conservative. All phonemes of Classical Arabic are represented in the dialect, but there are also many new phonemes. As in other Bedouin dialects, Classical /q/ corresponds mostly to dialectal /ɡ/, /dˤ/ and /ðˤ/ have merged into /ðˤ/ and the interdentals /θ/ and /ð/ have been preserved. In common with most Maghrebi Arabic varieties, the equivalent of Modern Standard Arabic /d͡ʒ/ is realised as /ʒ/. Hassānīya has innovated many consonants by the spread of the distinction emphatic/non-emphatic. In addition to the above-mentioned, /rˤ/ and /lˤ/ have a clear phonemic status and /bˤ fˤ ɡˤ mˤ nˤ/ more marginally so. One additional emphatic phoneme /zˤ/ is acquired from the neighbouring Zenaga Berber language along with a whole palatal series /c ɟ ɲ/ from Niger–Congo languages of the south. At least some speakers make the distinction /p/–/b/ through borrowings from French. All in all, the number of consonant phonemes in Hassānīya is 33, or 39 if you count the marginal cases, too. As in most Maghrebi Arabic dialects, etymological short vowels are generally dropped in open syllables (except for the feminine noun ending /-a/): */tak.tu.biː/ > /tə.ktbi/ 'you (f. sg.) write', */ka.ta.ba/ > */ka.tab/ > /ktəb/ 'he wrote'. In the remaining closed syllables dialectal /a/ generally corresponds to classical /ɡ/, while classical /i/ and /u/ have merged into /ə/. Remarkably, however, morphological /j/ is represented by [i] and /w/ by [u] in a word-initial pre-consonantal position: /u.ɡəft/ 'I stood up' (root w-g-f; cf. /ktəbt/ 'I wrote', root k-t-b), /i.naɡ.ɡaz/ 'he descends' (subject prefix i-; cf. /jə.ktəb/ 'he writes', subject prefix jə-). In some contexts this initial vowel even gets lengthened, which clearly demonstrates its phonological status of a vowel: /uːɡ.vu/ 'they stood up'. In addition, short vowels /a i/ in open syllables are found in Berber loanwords, such as /a.raː.ɡaːʒ/ 'man', /i.vuː.kaːn/ 'calves of 1 to 2 years of age', and /u/ in passive formation: /u.ɡaː.bəl/ 'he was met' (cf. /ɡaː.bəl/ 'he met'). ↑ Hammarström, Harald; Forkel, Robert; Haspelmath, Martin; Bank, Sebastian, eds. (2016). 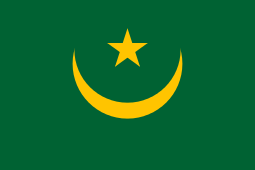 "Hassaniyya". Glottolog 2.7. Jena: Max Planck Institute for the Science of Human History.